I had a somewhat restless sleep, but dozed until about 09:00, before getting up and having a shower. I took it easy and checked various things on the Internet, eating an apple and a banana for a light breakfast. Around 10:30 I decided to go for a walk to stretch my legs and find some place to sit and then get lunch before returning to the hotel. I walked over to Rivermark Village again, being the closest place with likely establishments. I’d seen a burger place and bar there yesterday and though I could sit there and use the WiFi, which would hopefully be better than the hotel’s. I arrived a bit before 11:00, to find the burger place was just about to open, and there was a queue of people waiting outside. I found a shady spot to wait, then went in once the queue had gone. It looked like a full on restaurant with lots of booth tables, and waiting to be seated. Also, trying my phone, I couldn’t find a WiFi signal. So I left and looked for something else. I settled on the same bakery where I’d had the raspberry vanilla slice yesterday, The Prolific Oven. It also did cafe food, and was serving late breakfasts. 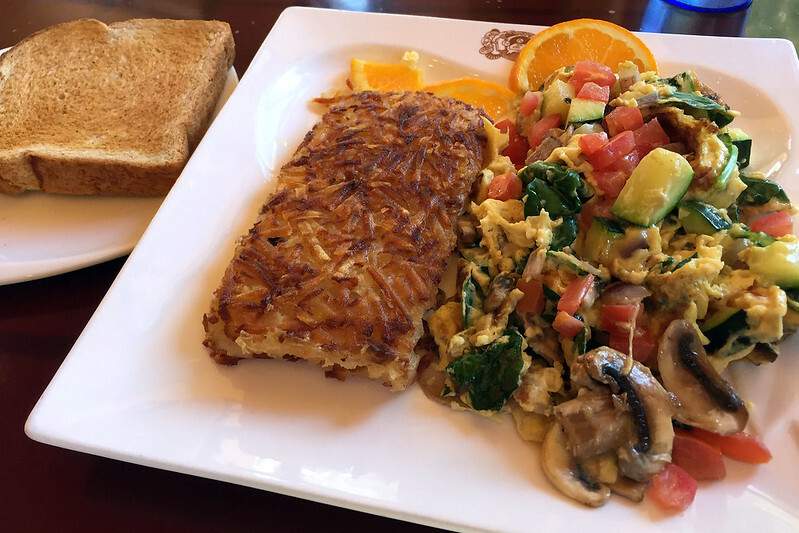 So I sat inside and ordered a “veggie scramble”, which was scrambled eggs with chopped zucchini, tomato, onion, and mushrooms, served with a hash brown and a slice of toast. There was no salt or pepper on the table, but there was a bottle of Tabasco sauce, so I added some of that. It was reasonably good. I sat and used their WiFi for a while, just taking it easy. About 13:00 I left to walk back to the hotel and wait for Lisa and Rick to pick me up in their car, to go over to Andy’s place. I waited out the front of the hotel and they arrived about 13:50, then drove us over to Mountain View. We had a bit of confusion finding Andy’s house, because the street numbering seemed to jump several hundred numbers between his set of apartments and the neighbouring one. Finding the right one, Andy greeted us and introduced two of his gaming friends, named Chris and Wade. A few minutes later Mary and Audrey and Owen showed up. We played several games throughout the afternoon: Cockroach Poker, One Night Ultimate Werewolf, Tsuro, and then Bohnanza. Mary sat out to keep Owen in check. The games were all fairly light and quick to learn, so that was good. 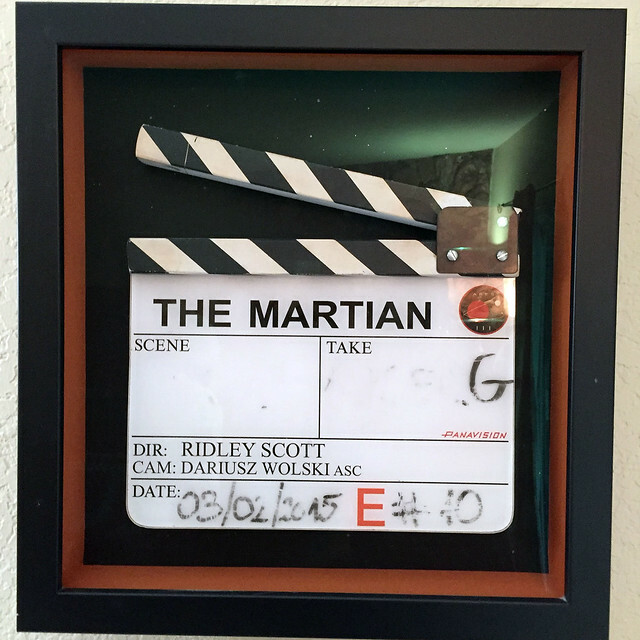 Andy had several interesting items related to his work on The Martian displayed around his home: a movie poster signed by the cast, a portrait of Matt Damon in astronaut gear, a clapperboard used during filming of the movie, and a genuine piece of Mars in the form of a Martian meteorite, sealed in a glass box. There was also a lot of general space related stuff, like a life sized Apollo moon landing space suit picture stuck on a wall, a poster of a Martian landscape from one of the rovers, and bunches of other NASA and planet trinkets, including planet coasters that we used under our drink glasses. He also had some things from his new book, Artemis, including a poster of the cover. Unfortunately he told me that the dialogue I’d helped him with for the Australian character had been cut by his editor. Late in the afternoon Lisa and Rick left to go home, Lisa wanting to get some rest as she was starting a new job. Wade offered to give me a lift back to the hotel later. Andy ordered pizza from a place nearby, and then had to go out and pick it up because they didn’t deliver. The pizzas were huge, so we only needed two. One was just tomato sauce and cheese, and the other had pepperoni, sausage, green capsicum, and onions. 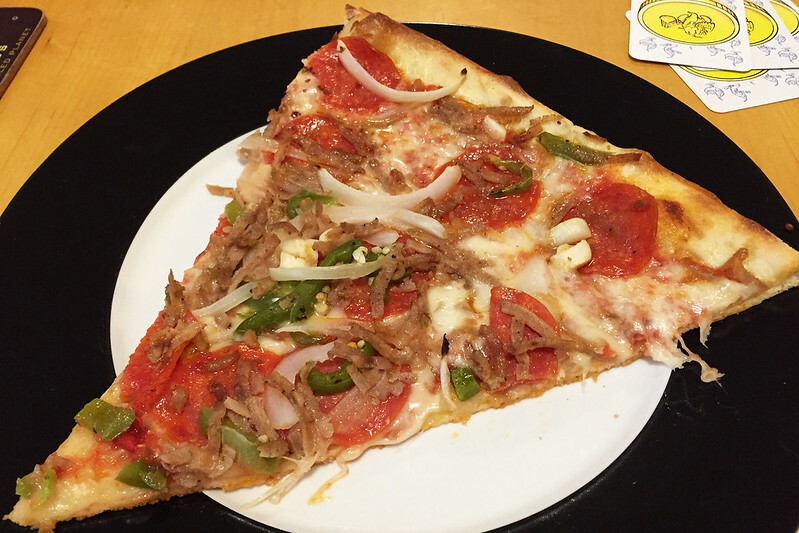 It was decent, and I had three big slices. After finishing the game of Bohnanza, Wade and I both said we were ready to go, so we said goodbye and he took me out to his car, a black Porsche 911. He drove me back, pulling some heavy Gs in corners, and I was at the hotel around 19:00. I decided to try the petrol station next door to see if they had any ice cream for a dessert. On the way, I noticed a small fridge in the hotel lobby full of ice creams, including Ben & Jerry’s. 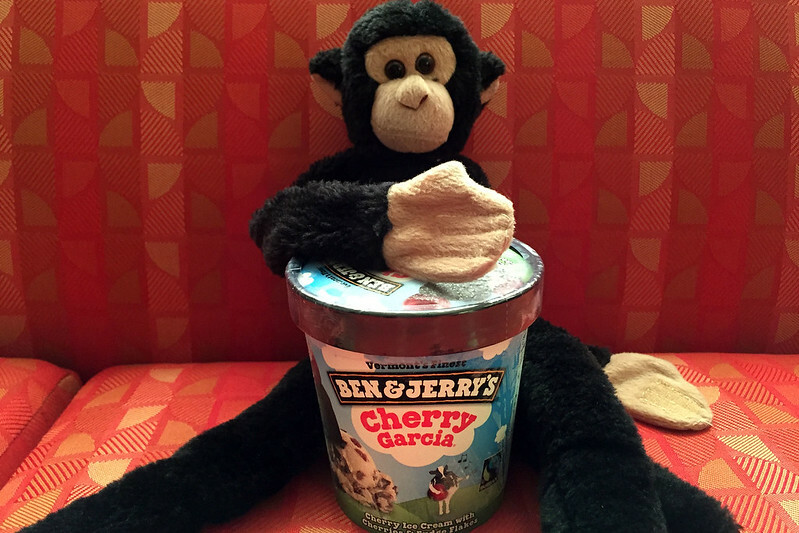 I checked the petrol station and determined that its selection was not as tempting, and so came back and grabbed a tub of Cherry Garcia from the hotel. I got some plastic cutlery from the bar and went back to my room to relax and eat the ice cream. After that I had a FaceTime chat with M. and then read a bit in bed until I got sleepy, going to sleep about 23:00 after setting an alarm for 07:30. This entry was posted on Monday, 12 June, 2017 at 18:29	and is filed under Diary. You can follow any responses to this entry through the RSS 2.0 feed. You can skip to the end and leave a response. Pinging is currently not allowed.